When Lyrical Venus first featured Emily Zuzik about a year ago, I wrote that her bio seemed to indicate she could do pretty much anything, and her latest collaboration with Moby just serves to prove that hypothesis further! Taking a stylistic turn that was outside of her usual comfort zone but perfect for the track, the result is titled The Low Hum and has elements that remind of Dido or Imogen Heap. Have a listen while reading what Emily has to say about collaboration, working with Moby, and getting a burst of new creative inspiration from the experience. 1) How did you connect with Moby for the track? 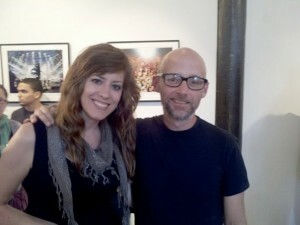 I met Moby initially when I was auditioning to sing for a blues-rock band he was putting together. I knew the drummer, Aaron Brooks, from a cover band we both played in called Aki is the Glue. Aaron suggested me, and I came into sing. That project never really took off, but later Moby contacted me about singing on some songs he was working on. That experience led us to working on co-writing a few and “The Low Hum” made his new record, Destroyed. 2) What was the most challenging aspect about the project? Well, I think co-writing is always a challenge. When you factor in that I was working on compositions that Moby had already written, and I’m sure in some way had envisioned a particular way, I found it challenging to bring something new to the song. I had heard that he worked with lots of people on the same track and then selected the version he liked best, so there was always a little bit of pressure to write the most intriguing version of the tune. It’s really funny how the lyrics I wrote for “The Low Hum” (without any background from Moby on the entire project) seemed to actually reflect his concept for the book and record. 3) What was the most satisfying aspect of the project? There’s the obvious one, which is to work with a successful artist to cowrite a song. There’s also the personal goal of getting worldwide exposure as a music writer and singer by being featured on Moby’s record and mentioned in the press for it. There’s an artistic aspect that I got to write outside my comfort zone on lyrics as well as in another music genre, and then have it released to the public in a big way. I am grateful to have had the opportunity to meet, get to know and work with Moby, who is a very successful artist and a very interesting man who works hard on causes he believes in. 4) How does the collaboration process differ from your solo process? Collaboration is always more difficult, but often yields greater results. You have two distinct personalities creating together. Sometimes it flows easily, and other times it’s like scaling a mountain. It really depends on how much oversight each writer takes on the other’s part, or if you’re creating both the music and the lyrics together, then how aligned are you at a concrete and interesting story? When I write on my own, I can say or play whatever I want–it can be good or bad, but the choices are all mine. When I work with someone else, we can get caught on a chord change or a turn of phrase to tell the story of the song. Sometimes “demo love” becomes part of the argument–that’s when you’re stuck on a particular version of the song and can’t hear it any other way. I’ve been doing a lot more collaboration in the last few years, and I really like where it’s pushed me as a writer and singer. 5) What new inspirations do you have or what are you excited about doing next after hearing the completed track? After working on “The Low Hum“, I was really excited about singing in a softer, more vulnerable way. 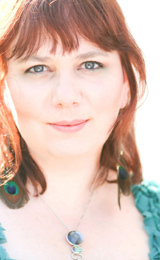 My go-to is the big, alto voice I have, and reigning it in to a softer, less “precise”, almost whisper quality has a lot of power in it. I learned that from working on this song. From here, I’m releasing my next record, The Wild Joys of Living, which has elements of that kind of singing on it in different songs like “Step Back” and “Outside.” I also have a couple electronic releases on XY Records in the UK that play with that singing style. It’s like a new page of creative energy was unleashed. 6) Anything else you want to share about the process? I would love to continue to work with others, and Moby again, should the opportunity present itself. I think it keeps writers working to make better songs and tell new stories. I’m not worried about staying genre specific and actually enjoy crossing the streams a bit. hey, it’s Jannie from last night at the Whip In O.M. I really like how Emily talks here about going outside her comfort zone working with Moby — I think wecall can relate to that, something we have to continually push, the olde comfort zone, but done with grace and open-ness it comes together. Inspiring to hear even successful musicians are working on expanding their zones too. It was a blast last night, Lyrical Venus I LOVE your songs a lot. So glad we met!!! Hi Jannie! Thanks so much for coming to check out Lyrical Venus! Glad you enjoyed Emily’s interview, she really is a great inspiration to keep expanding our boundaries! Your songs are sooo funny! Except when they’re really sweet, I noticed you snuck a few of those in there.